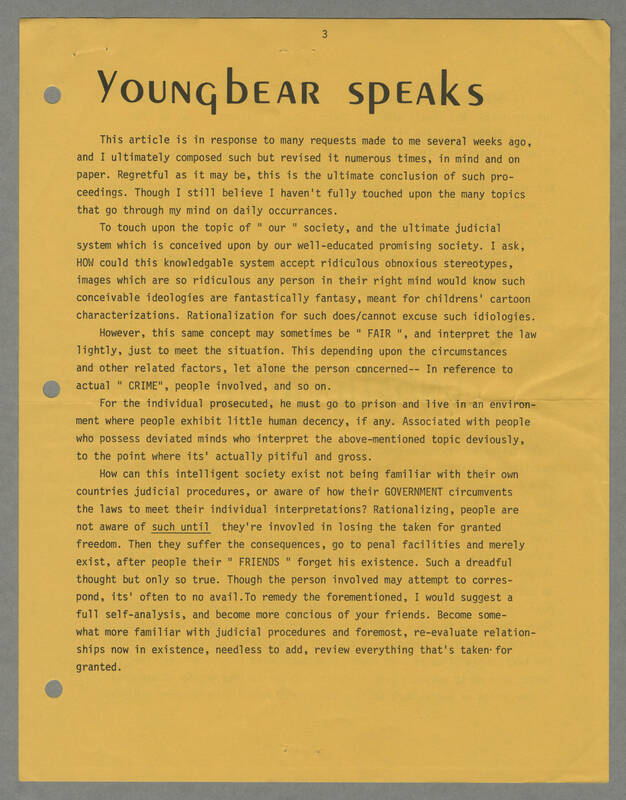 YOUNGBEAR SPEAKS This article is in response to many requests made to me several weeks ago, and I ultimately composed such but revised it numerous times, in mind and on paper. Regretful as it may be, this is the ultimate conclusion of such proceedings. Though I still believe I haven't fully touched upon the many topics that go through my mind on daily occurrances. To touch upon the topic of "our" society, and the ultimate judicial system which is conceived upon by our well-educated promising society. I ask, HOW could this knowledgeable system accept ridiculous obnoxious stereotypes, images which are so ridiculous to any person in their right mind would know such conceivable ideologies are fantastically fantasy, meant for childrens' cartoon characterizations. Rationalization for such does/cannot excuse such ideologies. However, this same concept may sometimes be "FAIR" and interpret the law lightly, just to meet the situation. This depending upon the circumstances and other related factors,. let alone the person concerned -- In reference to actual "CRIME" , people involved, and so on. For the individual prosecuted, he must go to prison and live in an environment where people exhibit little human decency, if any. Associated with people, who possess deviated minds who interpret the above-mentioned topic deviously, to the point where its' actually pitiful and gross.